The Windows Developer Day returns on October 10th and it’s being broadcast from London. There isn’t room for us to attend the broadcast (I asked several times) but we are able to go one better. On the next day (Wednesday 11th October) we’ll be joined by the members of the Windows engineering team who made the announcements for a special social, Q&A event. You’ll be able to ask them your questions about what was announced and anything to do with developing for the Fall (Autumn) Creators Update. After the last developer day we had a “viewing party” with a Skype Q&A straight after the keynote and there was a lot of feedback that you would have preferred more time to reflect on the announcement before asking questions. Hopefully, 24 hours will be enough. There will also be the opportunity to ask any other questions of the team and it’ll be great to meet up as a group again for the first time in a few months. If you’d like to come, please register on Meetup and we’ll look forward to seeing you there. I know the group’s been very quiet for a while. And, even though life’s been getting in the way, I’ve not forgotten about it. There’s a possibility of something later in the year (more details when I have them) but for now, I have a question for you. It doesn’t matter if you came to one meeting or dozens. You may have been to the recent meetings or not been for years. Whatever your situation, I’d love to hear from you. How, why, and was attending past meetings a good thing for you? I have my own thoughts based on “running” the group for 7+ years and had lots of positive and a few negative experiences along the way. (Maybe I’ll share them if you’re interested.) But, good or bad, I want to hear from you. Here are a few deeper questions if you have the time to give a longer answer but any response will be appreciated. Did you come just out of curiosity and to gain wider knowledge? Was it a way to learn or hear about something specific? Did you come with specific goals from attending? and were those goals met or achieved? Was it just an opportunity to pass the time with some free beer and pizza? Did the promise of freebies (SWAG) impact your choice to attend? How would your apps (and even your life) be different if you’d not come or the meetings had never happened? Is what you learned at past meetings still relevant or have you moved onto other things with no direct connection to Windows [Phone] apps? What persuaded you to come the first time? If you were nervous about attending at any time, why? Did anything happen or change to stop you wanting to come back? Would future meetings be interesting to you? What was the best thing about having attended in the past? Which meeting and for what reason (subject, speaker, location, whatever) was your favourite? This was totally unplanned but three of the last four guests on the Gone Mobile Podcast will be familiar to you if you were a regular attendee of WPUG meetings. In a break from the pattern of past meetings, on March 21st we’ll be having a series of discussions of what the future for Windows App developers looks like. Join us for a pub lunch to discuss how you see things going. Can’t make lunch? Join us for coffee in the afternoon to share your opinions or ideas. Not free until the evening? Join us and the Azure User Group to hear how bots might be the future. We’re back. And starting 2017 in style! This meeting coincides with the Windows Developer Day – Creators Update livestream but there’s more. Not only will we be having a “viewing party” but we’ve also secured access to a Q&A with members of the Windows engineering team straight after. This will be your opportunity to ask questions about what’s announced to the people who built it. This will be your opportunity to see what’s new for developers in the Windows 10 Creators Update. We’ll watch and learn what it means for your apps and games, and more about Microsoft’s latest developer products. Information will cover updates in developing for the web or UWP, the latest consumer apps, and line-of-business tools. While the live stream will be available online to anyone, the engineering team Q&A is only accessible to those who attend the “viewing party” in person. In addition to the exclusive Q&A, we’ll provide some food and drink to all attending. Plus, we’ll have some goodies to give away too. If you’d like to attend, please register on meetup so we know how many to expect and cater for. A. They submit 25 apps to the store. Well that’s what we did on the Saturday just gone. There were a mixture of new apps, apps updated to support Windows 10 (mobile and desktop as a single UWP) and other updates to existing Windows8.1 and Windows Phone apps. These are (most of–some are stuck in certification) the apps in question. If you’re not signed up to receive our newsletter (enter your email in the box on the home page if you want to join) you’ll have missed this. It feels like I’ve been doing this for years. Part of that is probably because I have. Those days of meeting in the basement of a pub to talk about developing for Windows Phone 7 are now just a distant memory. Since those days much has changed. Changes for me, changes for you, changes for the group and changes in the apps we develop and the platforms we develop them for. I know many of you who will receive this are no longer in a position to attend user group meetings or have other priorities in your lives (and apps). That’s one of the great things about life: it changes and presents new opportunities and experiences. If that’s you but you think there may be a time when you come to meetings again if the circumstances or the topic was right I’d love to hear from you what would bring you back. Is it a particular topic or speaker? Some specific type of event? Whatever it may be just reply to this email and let me know. I promise to read everything you write. It’s our regular meeting at Microsoft’s office in Victoria. We have two speakers arranged. Firstly Tarun Arora will be showing us some of the ALM and DevOps tools in Visual Studio Online. Then Timur from Badoo will share some of the tools and techniques they use to build their apps. 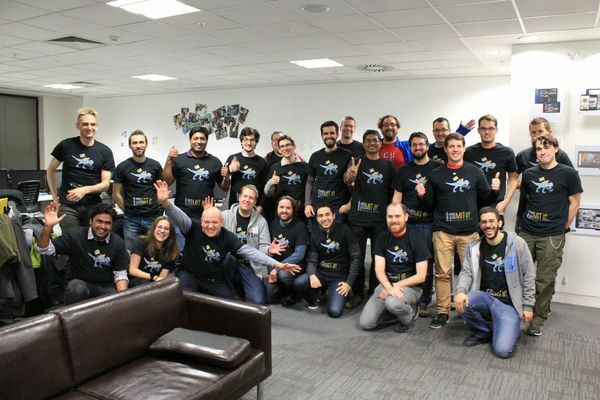 Back in April we held a one day hackathon in partnership with UICentric. It was so popular we’re doing it again. These events are a special type of hackathon where we explicitly focus on completing projects. If you want to come and build something from start to finish in a day that great but we also want to provide a space, opportunity and incentive for those of you who currently have something in progress to get it in a place where you can submit it to the store. That’s why we call this event ‘Submit-It!’. Apps World Europe is a major conference happening at London’s ExCel center on the 18th and 19th of November. After they heard how great the apps of the people who attend our meetings are they invited us to hold a meeting there at the end of the first day. So we are. You can attend the whole conference, just one day or just our meeting. Do whatever works for you. This month (September) Mike James will be returning to us to talk about Xamarin Insights. More details and registration on meetup. This is a book about products and services but equally applies to apps. Given multiple similar apps, why are some more successful than others and what can we learn from the ones that are successful so that we can be successful too? The structure and layout of the book is different to most but something you’ll recognize if you’ve read any of the Head First series. The book aims to provide a “formula for improving our chance of making a sustainable, bestselling product or service” or app! I think there’s something in it for everyone involved in app development and who want to create apps that uses will love and get value from. Obviously if you’re just building apps for yourself and/or to scratch a technical itch then carry on. Well, actually, upon reflection, there’s still something in this book for you too. Here’s the thing. When it comes to a product/service/app in any category or niche, what distinguishes the successful from the not so successful is not luck. It’s about making the person using it a badass! It’s about creating better users, not better products. The knock on from this is that people will talk about themselves more (people like doing that) and the reason for that will be your app. The most trusted form of advertising is recommendations from friends and family members. When others discover that the reason for then becoming badass is down to your app you’ll see the number of downloads of your app go up. You may have heard the advice that you should “build services, not apps”. While that advice is generally good, it’s better to not “build a better service, [but] make a better user of the service”. If you can create your app so that it creates a great Post-UX UX (the experience after using the app) then you’re on your way to a winner. The book has a lot of information to help you create apps (and services) that will help create badass users. That is users who “reliably perform in a superior way”. The advice covers everything you’ll need to know to help your users. Whether it’s practice, examples, struggle, progress, rewards, jargon, choices, memorization, willpower or affordances. There is a lot you’ll need to know and this book will help you through it. There are also two other things you’ll learn about that are especially close to my heart. “Cake features” and how you app can actually make people fat. Yes really. And how you can cause an emotional response in your users through appropriate prompts and a compelling context. I urge you. Go get and read this book to learn more. You owe it to the people who will use the apps you help create. Get it from Amazon or O’Reilly. Last weekend we organised the Submit-It! hackathon. It was one day of people finishing and then submitting apps to the Windows and Windows Phone stores. If you want to find out more, Jay has written a blog post about the day and there are lots of pictures on meetup. As the day proved so popular we’ll probably do something similar again.